Close your eyes and imagine you are a child again. The excitement for your holiday is palpable. You finally arrive and sitting there in the hotel lobby, to your delight, is an enormous indoor jungle gym that’s so big it looks as if it’s touching the ceiling! The mood for your holiday is set; you’ve just walked in and it’s going to be amazing. 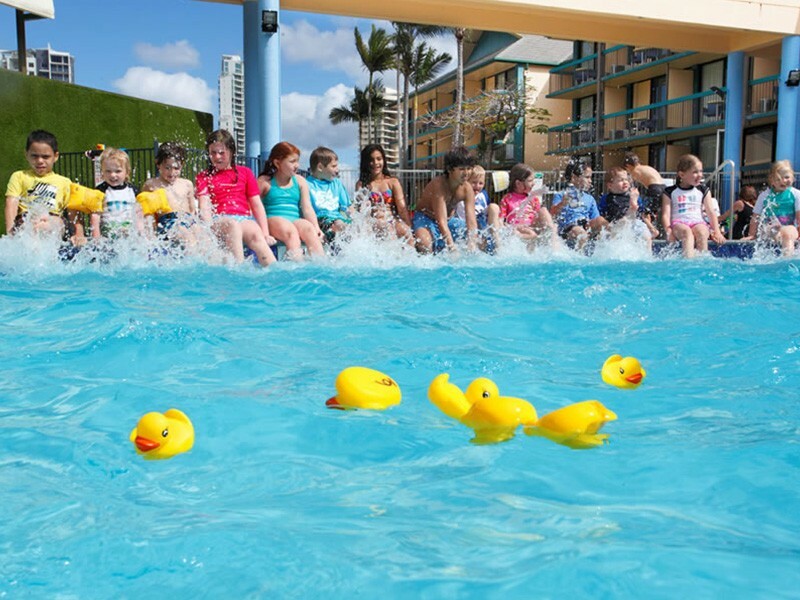 Paradise Resort provides an unforgettable holiday experience to countless families every year; "Heaven for Kids and Paradise for Parents", the resort boasts an extraordinary Gold Coast holiday. The location certainly helps too, Paradise Resort is set on a manicured 5 acres, every inch of which is dedicated to family fun via either themed suites, tropical lagoon playgrounds, sandy jungle gyms, well decorated and stocked kids club rooms and areas, and of course restaurants and cafes. 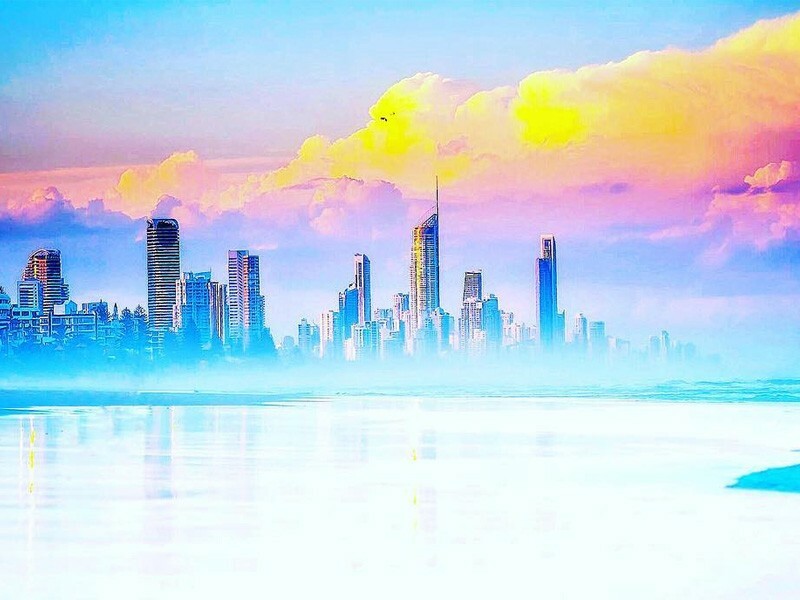 Step outside the resort and you are in Surfers Paradise – the heart of the Gold Coast, with local attractions, beaches, and dining all within walking distance. Sea World is a short five minutes away situated in Main Beach on the Broadwater while Movie World, Dreamworld, White Water World, and Wet ‘n’ Wild are all a hop skip and jump up the highway – for your convenience, both tickets and transfers can be organised through the tours desk in the gift shop. 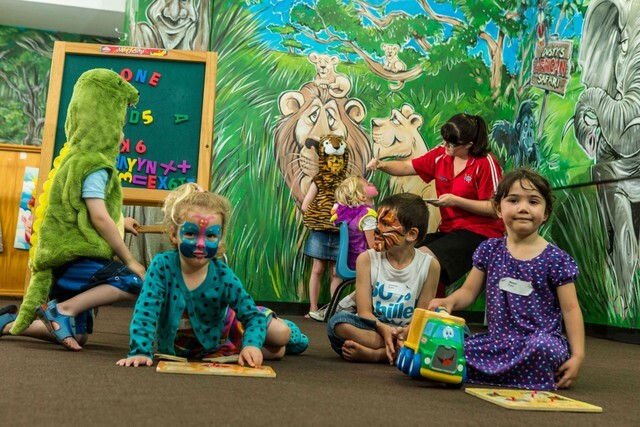 The Kids Club at Paradise Resort has long been one of the most popular children's programs for the Discover Queensland guests, we've had guests tell us their children wanted to stay in the Kids Club rather than venturing out to the theme parks! 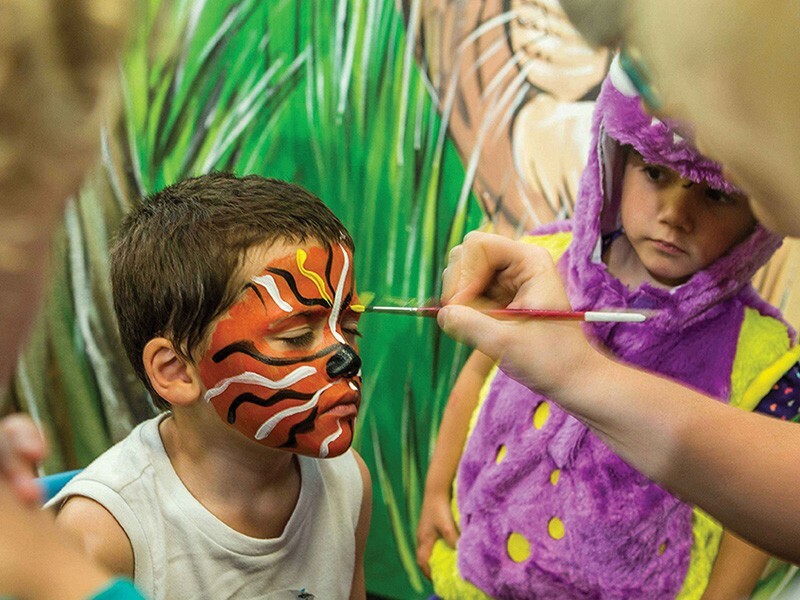 One look in the Zone 4 Kids Club’s colourful, themed rooms you'll see why. The kids club is spread across 9 spectacular rooms each with its own theme from spaceships to the jungle! The kids are separated into age groups to ensure they are having the most fun possible. The childcare staff are particularly talented in creating fun and engaging experiences with new programs, games, and activities constantly being created and re-invented to educate and entertain the mini guests. Guests are able to book their children into the classes 48 hours prior to arrival up to 2 hours before the session is due to begin, giving parents flexibility in their holiday schedules and planning. Parents can also specify dietary needs as well as book one on one care for children with special requirements. Paradise Resort recognise that families with children of all ages need a break and are proud to be the only resort in Australia offering high level of care for babies 0 to 2 years of age. Care for these young children follow the government stipulated regulations for carer to baby ratios giving families piece of mind. Have you guessed what the best part about the amazing multi-themed Zone 4 Kids Club facility is? Families are given four hours of child care, per child, per day for FREE! 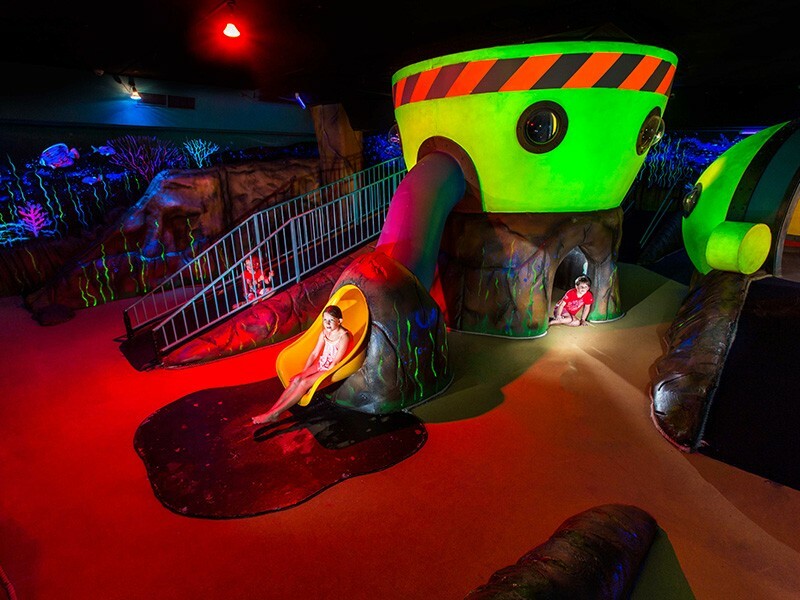 This gives kids the chance to adventure through every part of the thrilling kids club, while Mum and Dad have a chance to get away to the adult zone for some quiet time. Parents can relax in the heated spa or on the lounge chairs soaking up some child-free sunshine while enjoying the tapas and cocktail menu. For parents who want to keep going while the kids are entertained, Paradise Resort offer exclusive activities in the adult zone such as cocktail making classes and trivia sessions that are an absolute blast! There are also in-room massage packages available to indulge in. Outside of the kids club there are a plethora of activities to get involved in that can run as frequently as every hour during school holidays including cupcake decorating, aqua hunts, duck racing, jump rope splash, giant connect 4, pool noodle races, t-shirt creating, and so much more. Saturday nights (plus Wednesday's during school holidays) are dedicated to outdoor movies with a carnival twist. The Paradise Resort lagoon area is transformed into a giant theatre complete with hot dog carts, fairy floss, and face painting! The staff have even been known to get dressed up in the theme of the movie and get into character. While there is an amazing atmosphere during School Holidays, we've done some research about holidaying outside of School holidays and the benefits of taking your children out of school so you can make a well-informed decision on when to travel! Fridays are reserved for the fancy dress parade sponsored by Streets Ice Cream who give every child who participates a free paddle pop. 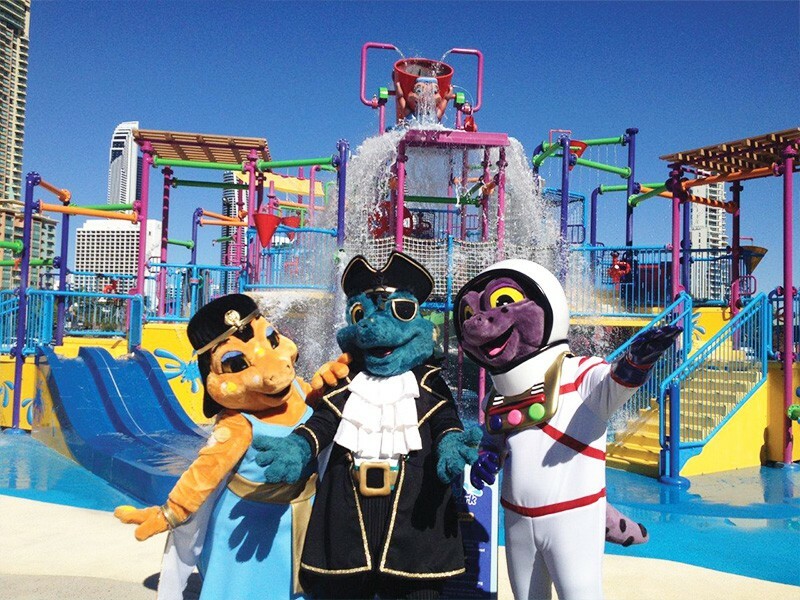 You can also see Paradise Resort’s very own gecko inspired theme jump to life in the character show run three times a week with the Captain, Astro, Cleo, and Dusty’s 15 minute dance performance that the kids will love. After all that Friday night fun why not start the next day with a BANG! Laser tag sessions are run in the Zone 4 Kids Club every morning from 8am during school holidays (selected days throughout the year). Next up you can take your holiday to new heights with Dusty’s Rock Climbing. The professionally trained resort entertainment crew can help all ages from 7 to 100 years scale the 9 metre wall on their choice of three difficulty levels. $15 a session includes all your safety gear and as many climbs as you dare in 1 hour! Perhaps a more chilled out experience is what you’re after? 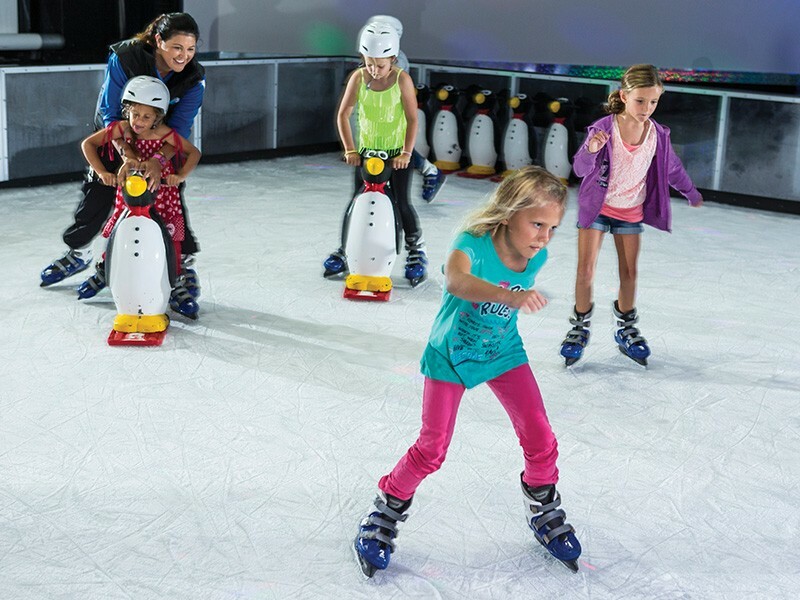 Check out Planet Chill – the resort’s very own permanent Ice Skating Rink! The two hour sessions are run three times throughout the day, so families can drop by at their leisure either to join the kids on the (real) ice, or watch over them with a coffee in hand. Sessions are $20 each, with the fourth entry free! No need to fear if they’re a bit wobbly, the resort have stabilising penguin friends to help the little ones get around without clutching the edges or falling over. For older kids Planet Chill has the chill zone, an area for teenagers to hang out that includes air hockey, snowboarding, and foos ball tables. Forever thinking of new and creative ways to engage the kids, the resort sometimes remove the shaved off ice from the rink and release it into the lagoon area for coordinated snow ball fights! Speaking of the lagoon, the crown jewel of the resort – the waterparks do not disappoint! The area is comprised of two enormous aqua playgrounds, a lagoon pool, and a large heated spa. 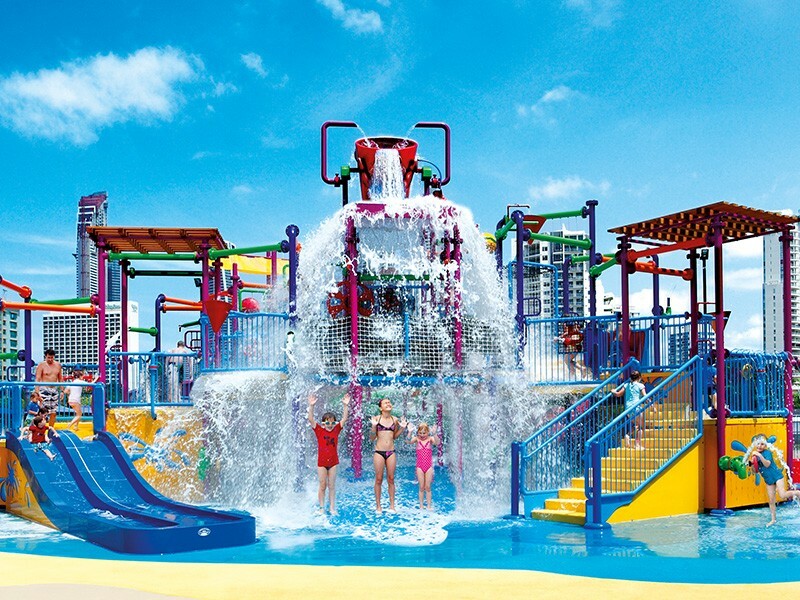 The Z4K water park is a multi-level behemoth that rises three levels featuring slides, climbing frames, water cannons, and it topped off by the giant bucket that sits atop the water park slowly filling to its 600 litre capacity before emptying itself over guests in one enormous splash. Small children have not been forgotten – they have their very own waterpark for under 5’s that includes a slippery slide, water cannons, tipping bucket, and a gently sloping lagoon entry into the wading pool. Paradise Resort is a truly unique utopia for families; as well as the lagoon and waterparks, Planet Chill ice rink, adult zone and spas, rock climbing, Zone 4 Kids club, and the expansive lobby jungle gym there are also a myriad of free activities for the kids to participate in throughout the day, giant chessboard, guest BBQ area, outdoor playground, fire truck tours, magic shows and more. Paradise Resort delivers a fairy-tale experience and always goes above and beyond. This is evident when you lay your eyes upon the spectacularly themed room suites. The basic suites are the Resort Room and then upgraded Superior Resort Room which are both suitable for 2 adults and 2 children; however, the fun really starts with the bunkhouse suites. These rooms feature either a queen or king bed with a separate kid’s area that is brightly painted with bunk beds that give the room an awesome cubby room feel that the kids love. They are also decked out with TV’s and Xbox 360’s (some even come with a Playstation 2!) to keep them entertained at all hours. 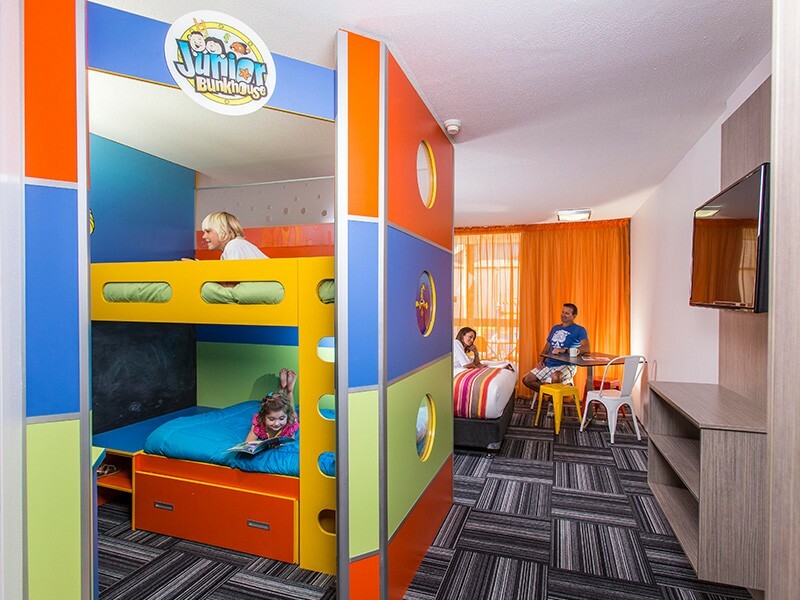 Lastly there are Family rooms and interconnecting rooms that cater for larger families and offer space for 2 adults and 3 children, 2 adults and 5 children, or 4 adults and 4 children – basically paradise resort can cater for even the largest of families all while keeping within their fun, gecko theme! Our 'Thank-You-DQ' hot tip is to take full advantage of Paradise Resort’s mini mart. 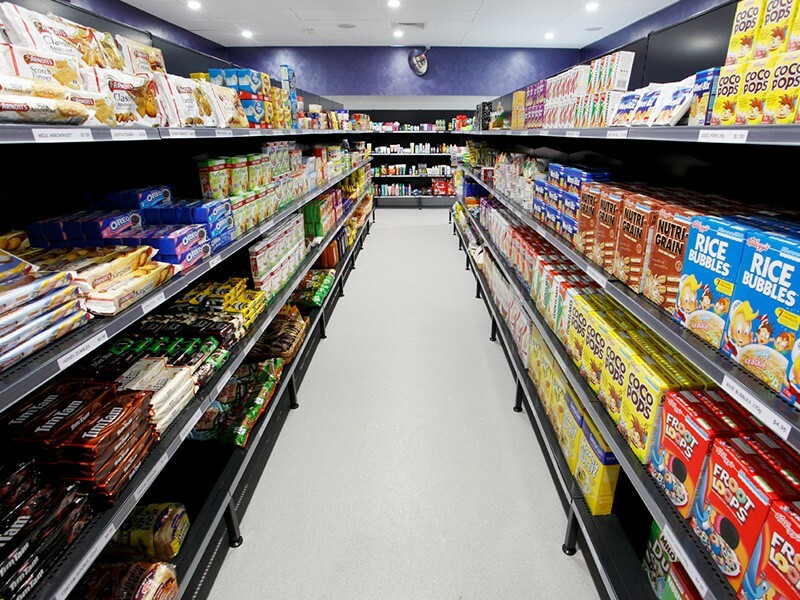 Set inside the resort, the grocery store is complete with everything you could need while away on holiday and is the perfect solution to alleviate costs by preparing lunches and snacks in your apartment. It’s also great for picking up last minute purchases or forgotten items like sunscreen and spare hats. What makes it really special? (Besides the alcohol section!) The prices are all comparable to your regular supermarkets so you won’t be blowing the budget. For keepsakes, trinkets, and souvenir shirts visiting the gift shop in the lobby entrance is a must. “Heaven for Kids!” That's what the sign out the front of this hotel says, and it lives up to it! If you are looking for a hotel that has everything to occupy the kids this is where to stay on the Gold Coast. The location of the hotel is within easy walking distance from the beach, shops in Surfers Paradise and to the tram stop to go to either Southport Shopping Centre, hospital or in the other direction Broadbeach for the Casino or more shops. “Amazing family resort!” I stayed there for a couple of nights with my kids and friend, excellent facilities, kids had a ball, big shout out too Kylie and Lauren from kids club, amazing and passionate at what they do! We will be back for sure! The cocktails are awesome!